Everything you need to know about Irukandji jellyfish. What happens to the human body when stung by a deadly Irukandji jellyfish. Two teenagers have been hospitalised with stings by deadly Irukandji jellyfish in waters off Fraser Island in southeast Queensland. The boy and girl were airlifted to Hervey Bay hospital on Friday afternoon after paramedics were called to their boat off the island’s western coast. Two other people in their group with suspected stings were treated at the scene. The barely visible creature, the Irukandji jellyfish, is also one of the most venomous on earth. If you’ve ever travelled to the Great Barrier Reef, you’re no doubt familiar with the Irukandji jellyfish. They’re the reason tourists wear wetsuits when swimming in the winter, and lighter stinger suits when swimming in the summer. But while you’ll hear the most about Irukandji around Cairns, they’ve also been spotted in Western Australia and the Northern Territory. And now, the deadly Irukandji Jellyfish are drifting further south along Queensland’s coastline. Irukandji jellyfish caught on the western side of Queensland’s Fraser Island on Sunday prompted a serious warning for swimmers to stay out of the water. So what are Irukandji jellyfish, and what are you meant to do if you’re stung? Irukandji (Carukia barnesi) are a highly venomous species of jellyfish, making them potentially deadly for those who have been stung. One of the most unusual symptoms is an impending sense of doom. Why are they traveling south? Professor Jamie Seymour from James Cook University says warmer temperatures are causing the jellyfish to be found further south. Around 12 months ago a boy was stung on Mooloolaba Beach on the Sunshine Coast and an Irukandji jellyfish was found on the western side of Fraser Island on Sunday. Have there been recent stings on Fraser Island? There were 10 suspected Irukandji stings on the western side of Fraser Island between December 22, 2016, and January 5 last year. Eight people were treated at Fraser Island for Irukandji-like symptoms in 2015. Have there been deaths from Irukandji in Queensland? In 2002, British tourist Richard Graham Jordan, 58, died after being stung by a jellyfish while swimming near Hamilton Island in the Whitsundays. The same year Robert King, 44, from Ohio died after he was stung while swimming on the Great Barrier Reef during a holiday at Port Douglas, north of Cairns. What do you do if a person is stung? 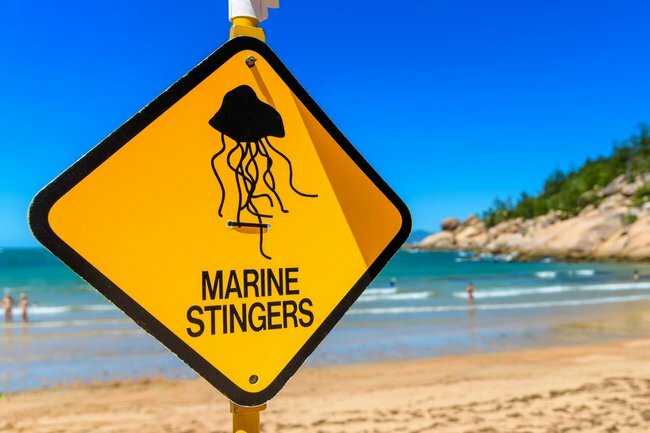 Surf Life Saving Queensland says if a person is stung a triple zero call should be made immediately and the sting area should be doused with vinegar as soon as possible.